Be Unmistakable is the Branding course you've been waiting for. It's here to teach you how to create a truly remarkable, badass Brand — on your OWN terms. The course first launched in 2015, and we had over 140 awesome entrepreneurs enrol + commit to taking their Brand to the next level. I've spent the last 6+ months updating the course — including building a brand new membership website and pimping out all of the content — and now it's BACK. 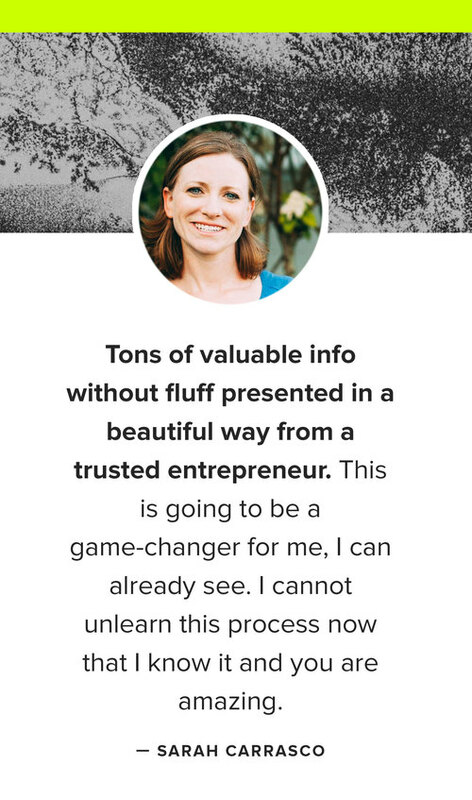 I'm more passionate than ever about helping entrepreneurs build businesses that stand out from the masses and reflect their own values + vision, and Be Unmistakable is my way to do that. The new-ish business owner who’s been in the game for a minute — and is ready to be seen & heard like never before. The fearless original who’s sick of the noisy virtual space, and wants to stand out from the copycat crowd. The design dabbler with a killer eye for good aesthetics — but isn’t quite sure how it all fits together. The gifted hustler who’s studied the greats — and wants to take their place at the table, too. The visionary ready to bring their ideas to the world — without fumbling through a few rounds of less-than-awesome branding. So if you’re ready to put the pieces together — to create a brand that looks, feels, and sounds like YOU, across all platforms and projects — welcome to the party. Come check out Be Unmistakable over here! If you’re up for it, I can’t wait to see you over in our Facebook group. Sweet things are about to go down. 4 Years In. This Is What I’ve Learned.